Detail of another printed plate in the series joking about the possible applications of steam power to daily life. Here the joke for the children is to imagine it being applied to gravedigging. 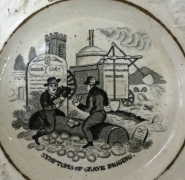 Detail of another child's plate from a series showing jokes about the applications of steam power in daily life. The 1830s was the decade when steam power was applied to passenger railways. Here it is applied to walking. 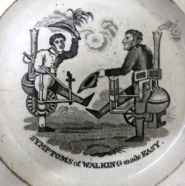 Earthenware child's plate printed with one of a series of jokes about the possible applications of steam power in daily life. The 1830s was the decade when steam power was applied to passenger railways. The idea of applying steam power to ploughing (seen here) seemed just as preposterous as applying it to gravedigging or walking (see two other plates in this series).